Through the (literal) shitey work the Co-op Insurance company are making of our bathroom and kitchen; the shitey nastiness of some campaigners that are supposed to be on our side, I had two wonderful pieces of news today. The first came from a dog walker I know as I walked around Kilmardinny Loch this morning with Cody, our TV dog (something he is called by one if the other walkers!). She presented her new dog, a really cool looking all black terrier. She got him from a dogs home, where he has been languishing over the past two years. She told me that he has had a really tough time- he had been attacked multiple times and has part of a lip missing and part of an ear and he had been "evidence" in a court case, hence his long impounding. She said she brought him out around our beautiful Loch for the first time yesterday and he couldn't believe the wonderful space, sniffing and running around everywhere as he explored. He looks brilliant, a real wee alert livewire. A smaller version of our own muttley. The second piece of good news came when I got to the northern part of the loch. The woman who calls Cody "TV dog," was with her elderly mum, seemingly feeding the ducks. 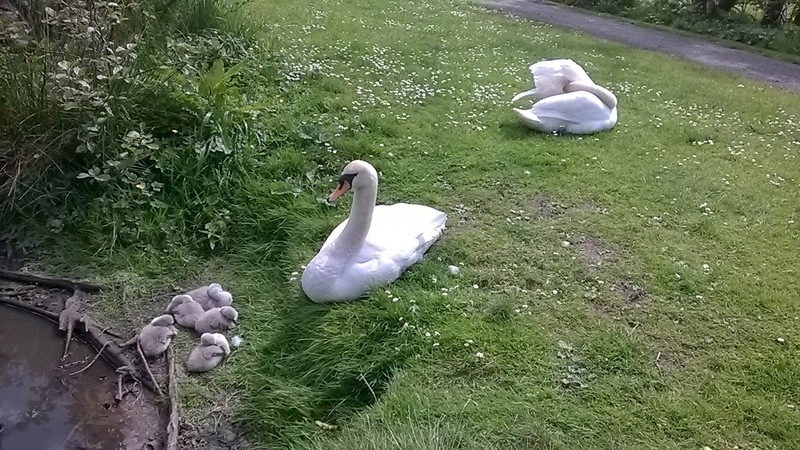 I said, 'Hi," and she greeted Cody, as dog owners do, and then pointed out the swan's five new signets! This kind of overwhelmed me. Which is weird, but everyday I have been checking out the female swan, to see if she was off her nest. 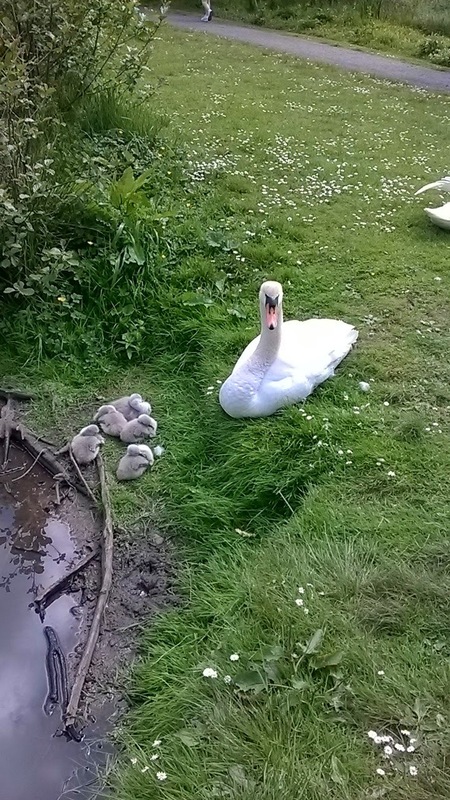 Their last family left in early 2013, shortly after which they had more eggs that didn't hatch. It had made me feel sad seeing them paddle about the loch having watched them bringing up their last family from eggs and last years disappointment. Kilmardinny dog walkers- dogs on leads and full alert in foxes in the coming weeks! A great start to the weekend after a shitey fortnight.